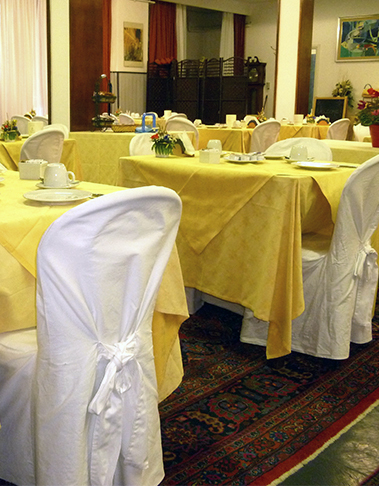 breakfast is served in a spacious room situated near the hall from 7 to 9.30 a.m.
Our rich buffet is characterized by typical Ligurian products, such as “focaccia” and other local specialties. Moreover, you can find a wide range of sweets, marmalades, fruit juices, yogurts, cereals, cheeses, eggs, cakes and croissants. Nonetheless, to start the day in the right way, don’t miss to taste our hot drinks like cappuccino, tea (with a rich selection of tea flavors), coffee or chocolate.